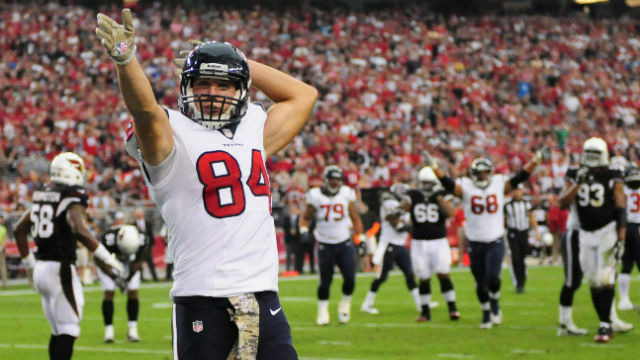 What does tight end Ryan Griffin love most about the new Texans offense? Under head coach Bill O’Brien, the Texan will have a game-plan offense that evolves from week-to-week depending on the opponent so players are expected to be versatile. In his system, tight ends have one of the toughest positions to learn on this offense, other than quarterback, according to O’Brien. The second-year tight end doesn’t have to look far for guidance. He has already formed a bond with the Texans tight ends coach John Perry who has ties to Griffin’s home state of New Hampshire. Perry was a star athlete and coached for the UNH Wildcats. Griffin and Perry often talk about their mutual acquaintances from back home. Griffin, who started eight games as a rookie, had 19 receptions for 244 yards and one touchdown in 2013. Since his first training camp last year, he has adjusted to the heat and used the offseason to improve his strength and improve his mechanics.